QUESTION: Marty, you have said that the turning points are just that, turning points. So if we get a high or double top the first week of September, will the market still rally thereafter? Are we looking at a cycle inversion here, where the ECM begins to rise while the market declines sharply? If not, then what do you think will happen? ANSWER: Yes, these are turning points and they do not always reflect the direction because some markets are peaking while others bottom at these turning points are on a global scale since this is a world model. 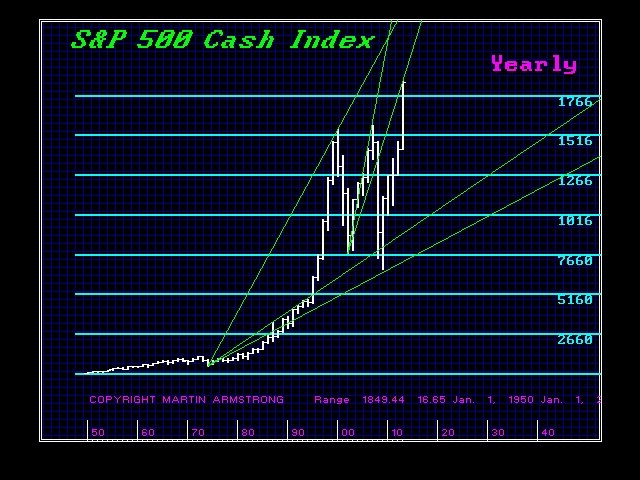 The 1987 turning point was to the day, but it picked the low of the crash not the high. The US share markets was not the focus but a reflection of the real change underlying everything – capital flows. It was Japan and its share market that was in a perfect alignment with the ECM. 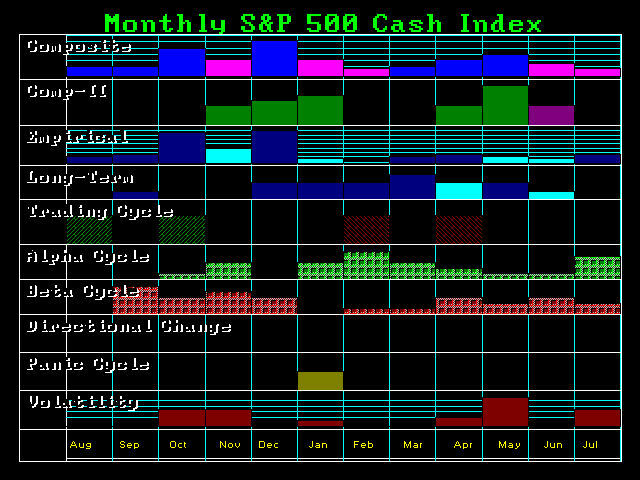 The capital flows shifted with the ECM and became focused on Japan for the 1989.95 turning point. True, we stated there would be a crash in the USA and I even warned the White House of that 2 years in advance in 1985 because they were forming G5 to manipulate the dollar lower to reverse the trade deficit. That reversed the capital flows and the US share market was simply the casualty of war – collateral damage. That is why the day of the low we said that was it, the low would hold, and that new highs would be seen in sympathy with Tokyo going into 1989. 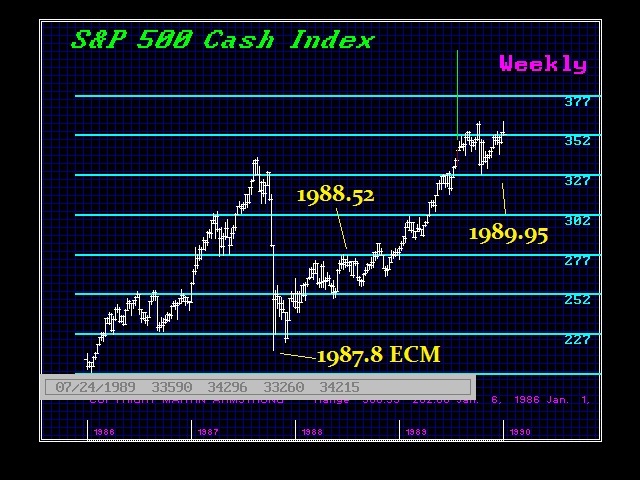 The US new high came the week of July 24, 1989. 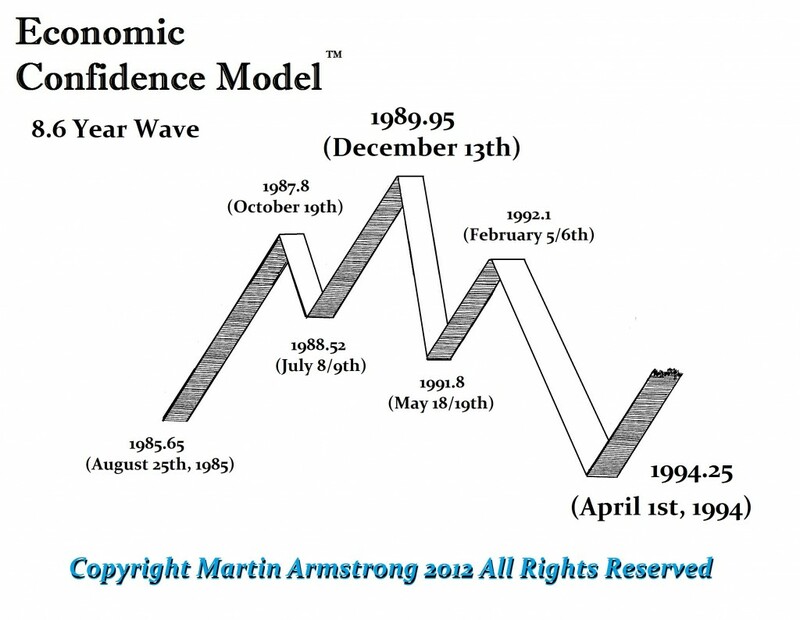 The first Weekly Bullish Reversal was elected the week of April 10, 1989, which was 77 weeks from the low. The US market followed the overall trend, but it was not the primary focus. Why did it bottom with the ECM? It was not the actual share market that was the driving force, it was the G5 manipulation of the dollar and the fear the dollar would fall another 40%. It was an exodus of foreign capital, not ONLY the share market. 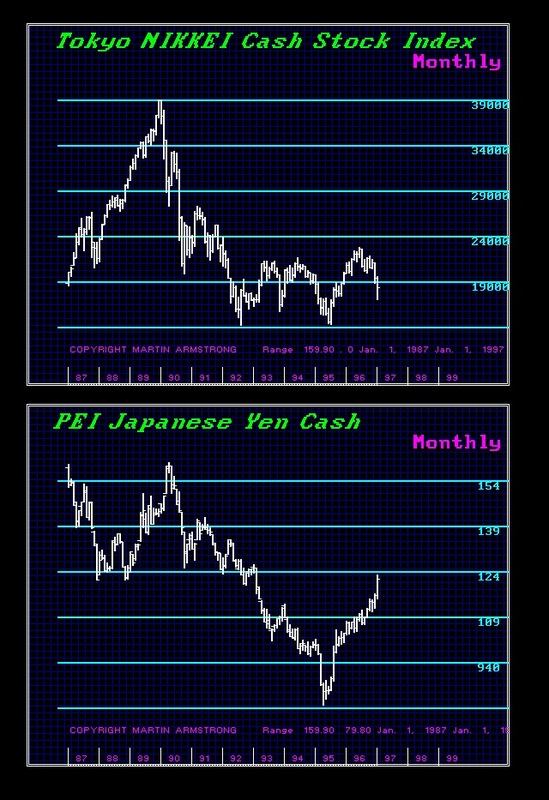 The capital flows during the crash sent the yen soaring, but it then backed off into 1988 with the capital flows. 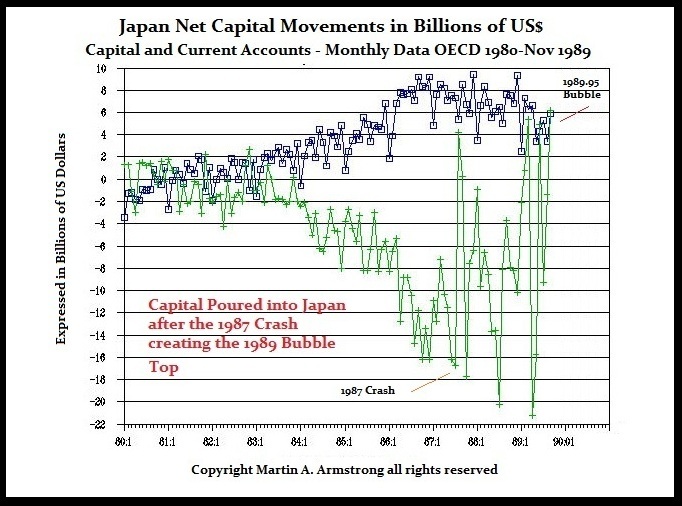 Then the trend reversed and capital poured into Japan for 1989 as all foreigners then were buying Japan creating the bubble. Currently, liquidity remains very low – still at about 50% of 2007 levels. The retail market is not in the US shares so we do not yet have the froth foaming. Once again, the forecast is NOT about the share market – it is concerning capital flows. The US share market is the only game in town for big money that is smelling a problem in the debt markets. We have Germany wanting to impose a 5% surcharge tax to bail out municipal debt and confiscate 10% of your bank account to bail out the banks. Hollande in France is firing everyone but himself and he is taking France down the tubes. This is NOT the bull market of old. This is all about capital flows. That is what will start the turn here the first week of September. We have been stating that for a couple of years now and going into October/November has not changed. Here is the monthly array from last year. This was showing the change in trend in July and then September. So nothing has changed from that perspective. We have the same problem right now. The US share market is NOT lined up with this wave of the ECM. This warns we are dealing with a casualty of war and the focus again is the shift in capital flows thanks to war, collapse of Euro, and the Sovereign Debt Crisis. 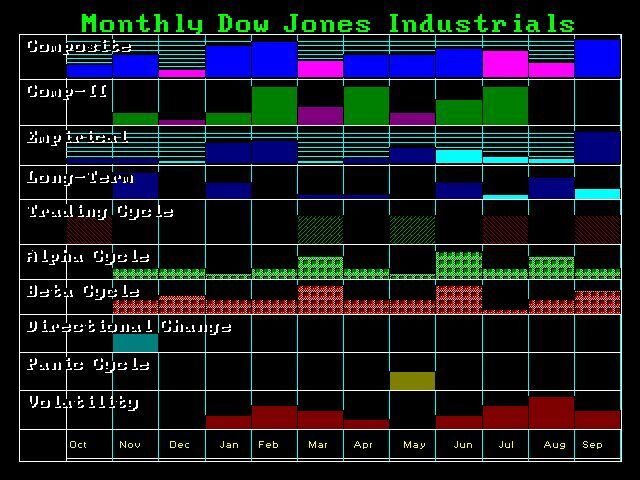 Looking at the current Array, we still see October November as rising volatility and December year-end remains a target. We still see the risk of a high 2015-2016 with exceptionally high volatility in 2017-2018. The question we will address at an upcoming live internet conference will be this critical issue. Are we moving for a Phase Transition now, or are we extending the entire cycle because everything is crumbling around us even geopolitically? 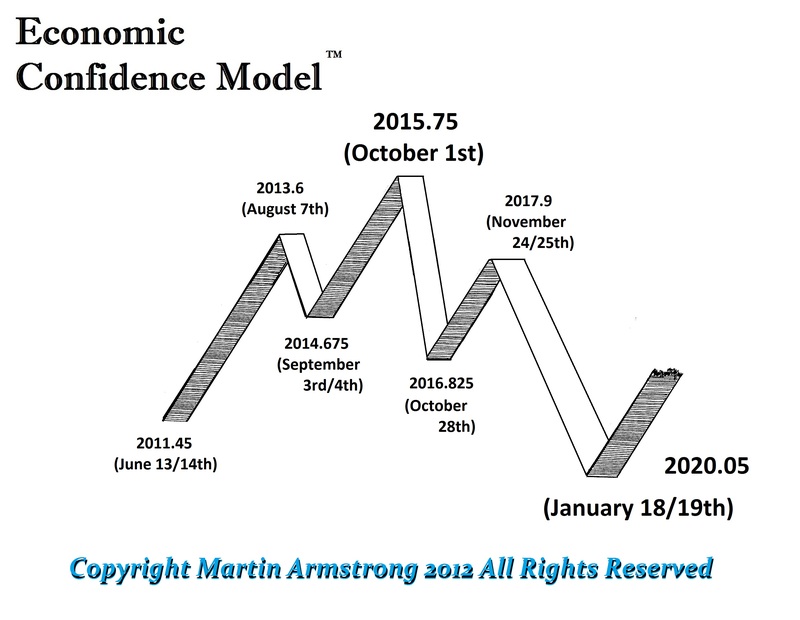 We have been warning of a potential cycle inversion caused by all these trends converging. We have been warning this could not be determined until September.